Each day ConservativeHQ.com conducts a “Daily Debate” poll of the limited government constitutional conservative and Tea Party leaders and activists who visit the website. The poll is, admittedly, not scientific, but it has always provided an excellent snapshot of conservative opinion that is often later reflected in major polls conducted according to scientific polling methods. 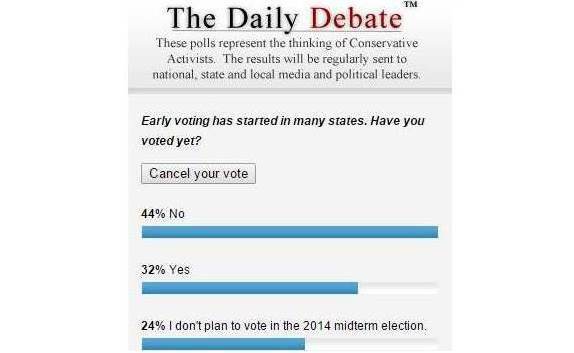 So yesterday, when our “Daily Debate” poll asked, “Early voting has started in many states. Have you voted yet?” And 24% of participants answered, “I don't plan to vote in the 2014 midterm election” we were shocked – and frightened. If 24% of the principled limited government constitutional conservatives who make up CHQ’s core readership skip this election it will mean the election will not produce the predicted wave for the Republican Party and conservatives, but instead there will be a devastating continuation of the Democratic majority in the Senate and a continuation of Obama’s agenda to “fundamentally change” America. Friends, even though the national leadership of the Republican Party has done an abysmal job of nationalizing the election, we cannot let that happen. Yes, Ron Paul and his delegates to the 2012 Republican Convention were treated in a ham-handed way by Reince Priebus and other establishment Republicans. Yes, it made all of us angry when John Boehner, who was made Speaker of the House through the efforts of millions of Tea Party movement voters and volunteers, refered to limited-government constitutional conservatives as “knuckle-draggers." And yes, many of us are still furious about the way the Mississippi Republican primary played out and how the Republican establishment rallied to renominate Senator Thad Cochran by using the race-baiting tactics of the Left. But much as we hope for change to come in great waves, most of the time politics is an incremental process. Although they are coming too slowly for many of us to always remain optimistic, the increments are working in our favor – in favor of the governance of America according to conservative principles. Now is not the time to stay home and withhold your vote because you feel conservatives were mistreated during the primary season, or because of lingering resentment from the 2012 election. Now is not the time to allow Obama and his Democratic allies in the Senate two more years to complete their threat to fundamentally transform America. Now is the time to force a conservative mandate on the Republican Party’s reluctant leaders by making sure that Scott Brown defeats Jeanne Shaheen in New Hampshire and goes to Washington to stand against amnesty for illegal aliens; now is the time to make sure that Thom Tillis defeats Kay Hagan in North Carolina and goes to Washington to force Obama to close our borders to travelers from Ebola hotspots; and now is especially the time to make sure that Iraq War veteran Tom Cotton defeats Mark Pryor in Arkansas and goes to Washington to help us craft an effective strategy to destroy the threat of the Islamic State.